Reading the opening lines of this small children’s book were enough to lure me in. That, and the fact that Maurice Sendak created the images, intrigued me. I was not disappointed. This short children’s book is indescribable, and hard to categorize. In many ways, it’s like a little fable, but it’s also written with beautiful lyrical words, and has several full-page poems in it, so that it feels like an extended poem. The experience of the story is gentle and soothing, and could be a very sweet bedtime read-aloud. The content of the book may be a little sophisticated for children of any age — after all, what children under 7 know the color of coffee with cream in it. Yet that doesn’t seem to matter at all. 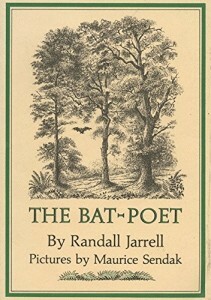 It’s such a sweet story of a little bat who wants to write poems and tell people about the world they haven’t experienced. His little spirit is buoyed by reading his poem to animals who enjoy them, and he is resolute about continuing when he meets with rebuff. I find that a gentle children’s book is worth one hundred of the loud and clamoring assaults we offer to children these days. The nature orientation of the book makes it fit well with the Waldorf philosophy as well. I love this little book, and would recommend it as read-aloud to 5 to 7, and perhaps older.